Vintage 'Watermans' Fountain Pen, 14ct Nib, Made in England. Waterman Stainless Steel Fountain Pen In Box - Assistant Vice President 2018! bridgecount has no other items for sale. Sheaffer snorkel for repairs, gold nib, seems to have a broken section. 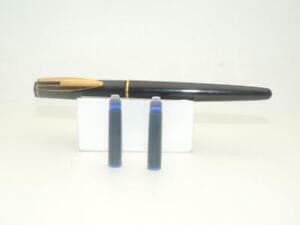 Blackbird Mabie Todd fountain pen, gold K flexing nib, model BB2 1/2 60. Conway Stewart 286 fountain pen, 1 mm tines flex CS gold nib, good condition.